The first “FineCat – Symposium on heterogeneous catalysis for fine chemicals” was held in Palermo, Italy, on April 18-19, 2012 in the splendid venue of the Steri Palace, hall of Palermo’s University Rectorate. 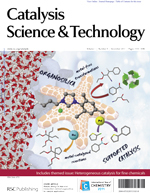 The idea for this meeting was born out of the 2011 themed issue of Catalysis Science & Technology, Heterogeneous catalysis for fine chemicals (dedicated to Professor Michele Rossi), and took less than 3 months to go from idea to reality. The scientific programme featured 14 symposia and 5 poster presentations, with the best poster winning the acclaimed Catalysis Science & Technology certificate and a copy of Enantioselective Homogeneous Supported Catalysis. The lectures and posters highlighted exciting chemical innovation from theoretical through practical approaches including predicting catalyst performance, gold catalysis for selective oxidations, asymmetric syntheses and hybrid silicates, bio-hydrogen production and photocatalysis for organic synthesis. Younger and more experienced scientists at the Symposium were chosen in a good balance to present and discuss advances in the field, whereas eminent chemists Graham Hutchings from Cardiff University and Gadi Rothenberg from the University of Amsterdam were invited to give the plenary lectures. On April 18th, Professor Rothenberg opened the conference with a lecture on a simple, but effective, new method for predicting catalyst performance…. He explained how, if we wish to screen a large numer of catalysts (i.e. 100,000 catalyst every day at one second per catalyst rate) DFT and semi-empirical are “out of game” which leads to a need of a fast and necessarily unsophisticated approach for screening heterogeneous catalysts. He then showed that heterogeneous catalysis can basically be modelled as an electronic interaction between molecules and a metal set of atoms even if the species involved are not molecular. According to this approach, Slater-type orbitals of 1930 [Phys. Rev. 36 (1930) 57] are simple and effective descriptors for metal’s electron distribution. In detail, researchers use 4 descriptors/parameters that the computer can calculate very fast. Hence they model adsorption and catalysis by combining four parameters for metal and four for the adsorbate. Applied, for example, to the reduction of a carbonyl compound over supported monometal catalysts the predicted and experimental yields are in surprising agreement: namely 85% of all predictions are correct [Top. Catal. 53 (2010) 1202]. The following day, the vice chancellor for research at Cardiff University Graham Hutchings gave a remarkable talk on the latest developments using supported gold and gold palladium nanoparticles as heterogeneous catalysts including the direct synthesis of hydrogen peroxide [Science 323 (2009) 1037] and the oxidation of toluene [Science, 331 (2011) 195]. He first told the story of gold catalysis dating back to his days at ICI in South Africa and then at the University of Witwaterstrand after which in the early to mid 1980s he [J. Catal. 96, (1985) 292] and Haruta first predicted and then discovered that gold — when prepared as supported nanoparticles — is in fact an exceptionally effective redox catalyst, very active for example for CO oxidation [Nature 437, (2005) 1098] and acetylene hydrochlorination. Professor Hutchings explained how first almost no researchers believed in these results as this observation is counter intuitive since extended gold surfaces do not chemisorb oxygen, nor do they corrode. As a consequence, he emphasized how growth in the numer of research papers dealing with gold-based catalysis was very slow for at least a decade. Since then, however, there has been an explosion of interest in gold as a catalyst and gold catalysis is now a major topic for both heterogeneous and homogeneous catalysis worldwide; as shown in Palermo by the presentation of Cristina Della Pina who outlined a decade of research on gold-catalyzed oxidation [Catal. Sci. Technol. 1 (2011) 1564] in the Group of Michele Rossi at the University of Milan. Recent aberration-corrected microscopy studies on the nature of the active site for CO oxidation have revealed that the active species may involve only 7-10 gold atoms [Science 321 (2008) 1331]. Professor Hutchings then showed how this advanced microscopy technique lately allowed his Group to identify the active, bi-layers of gold nanoparticles in oxidation catalysis; whereas traditional TEM images were completely misleading affording unresolved micrographs of both unactive and highly active gold catalysts. These studies have been systematically conducted with Chris Kiely, an exceptional microscopist now at Lehigh University in Pennsylvania, with whome Hutchings has published some 100 research papers. David Willock and Peter Miedziak, also from Cardiff Catalysis Institute, respectively discussed the partial oxidation of cycloalkenes using gold catalysis by elegant DFT calculations and the experimental findings emerging from the application of Au and AuPd nanoparticles to the oxidation of diols under mild conditions. Their colleagues Jenny Edwards and Gemma Brett reported the latest results on how to improve the activity of Au/Pd catalysts for H2O2 synthesis and on the oxidative transesterification of 1,2-Propanediol using gold-based catalysts. Michel Wong Chi Man, from Montpellier’s Institut Charles Gerhardt, gave a nice talk on the versatility of catalytic usages sol-gel hybrid organosilicates [Catal. Sci. Technol. 1 (2011) 1544], whereas his colleaugue Hubert Mutin presented the easy and powerful non-hydrolytic sol-gel methods to oxidation and metathesis catalysts [Chem. Soc. Rev. 41 (2012) 3624]. University of Milan’s Professor Laura Prati gave talk on biomass valorisation by oxidative processes based on gold and palladium aerobic catalysts whereas University of Messina’s Candida Milone presented interesting results on the oxidation of glyoxal to glyoxalic acid using gold catalysts. Dr Elka Kraleva, from Rostock’s Leibnitz Institute for Catalysis, presented related results on biomass valorisation by showing the latest results on the energy efficient production of hydrogen from bio-ethanol using low-cost catalytic systems developed in Germany. University of Palermo’s Marianna Bellardita discussed the use of brookite TiO2 photocatalysts for pollutants degradation and organic synthesis, a topic that was related to the presentation of both her colleagues Maria Luisa Saladino on the stabilisation of anatase catalysts and Daniele Enea on photocatalytic cementitious coatings. Ana Rosa Silva, from Portugal’s University of Aveiro, presented good results on anchored copper (II) complexes as asymmetric heterogeneous catalysts for the cyclopropanation of styrene. Palermo’s CNR Rosaria Ciriminna ended the scientific program with a presentation on newly developed multifunctional palladium and platinum nanocatalysts. The poster prize was awarded to Ermelinda Falletta for her poster about the green synthesys of polyaniline, polypirrole and their composites. The contribution disclosed how supported gold catalysts enable the high yield synthesis of these valued conductive organic polymers avoiding the use of strong oxidants traditionally employed in their manufacturing. In summary the original aim of the Symposium, a plea for intensified interaction between theory and experimental practice as well for a systems view of heterogeneous catalysis for organic synthesis, was fully achieved. On April 18th, the University of Palermo’s Rector, Roberto Lagalla, offered to the delegates a guided tour of the Palazzo Steri wherein the celebrated painting “La Vucciria” of Renato Guttuso is conserved. 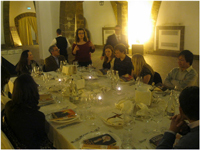 Scientifc exchange and networking was certainly eased by the informal style of the Symposium along with the unique milieu of both Palazzo Steri and the Cantine Florio of Marsala wines, where the Symposium gala dinner was offered, in a proper balance between science, art and entertainment. The 2nd edition of the FineCat Symposium will be held in Sicily on April 2013. Fantastic post, very informative. I ponder why the opposite experts of this sector don’t realize this. You should continue your writing. I’m confident, you have a huge readers’ base already!|What’s Taking place i’m new to this, I stumbled upon this I have found It positively helpful and it has helped me out loads. I hope to contribute & help other customers like its helped me. Good job.